Before embarking on a full-scale network analysis of Northern Mesopotamian EBA cities, it seemed prudent to do a small test case to see 1. if it would work at all, 2. what kind of results we might expect, and 3. what kind of information should we be collecting. Today I want to talk about number 3. What kind of information should we be collecting? We decided to start with lithics, since Tobias’ recent dissertation focused on lithic use. We thought it might be an easy entry point to try a preliminary analysis since we could easily create the table of data necessary from his background knowledge. Since it was only a feasibility test we were not too concerned with the specifics of the data, knowing we could refine and update the data later if it turned out to be a useful avenue for our test. We supplemented our chart using data from the ARCANE database. 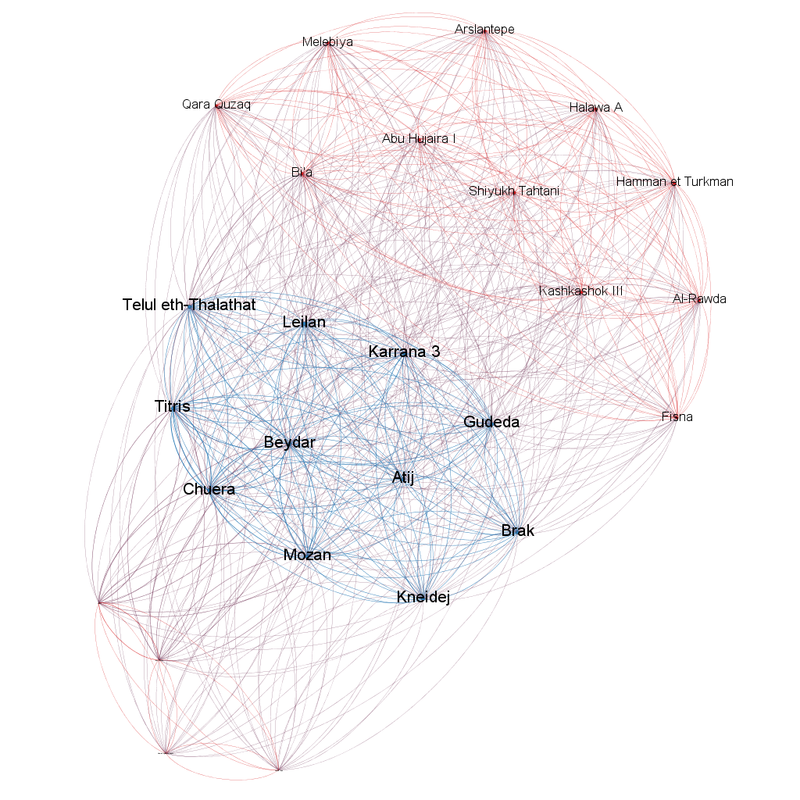 While the graph is interesting and appears to show many connections, if we sought to explain anything about EBA connections between cities, there is little to say using this graph. It shows that some sites have more than one type of lithic used, and that those are more central to the network. But if we think about this in terms of what the graph means, we are saying that sites with a more diverse lithic assemblage are somehow more central to EBA system of cities, but in fact, that may not be true. Even by reducing the interpretations to only lithics, it also does not tell much since the data was selected poorly – obviously sites with Canaanean blade production with have evidence of finished Canaanean blades as well, thereby setting up these sites to be most central to the network (e.g. Titris and Chuera), but in fact we do not know that Canaanean blade production does in fact make a site more central to the system, instead it may be that Titris and Chuera are peripheral to the network and finished blades are distributed through sites that are central in other ways. In short, by not thinking carefully about the categories we chose for this analysis, we set the analysis up to fail. After realizing that the graph was not particularly illustrative, I still decided to play around with it a little to see how I could manipulate the data and use it as an experiment for thinking about what kinds of categories I will need going forward and how I can rectify some of the problems I created in this test case. Also, this graph suffers from the dreaded “spaghetti monster” problem where every node is connected to almost every other node. 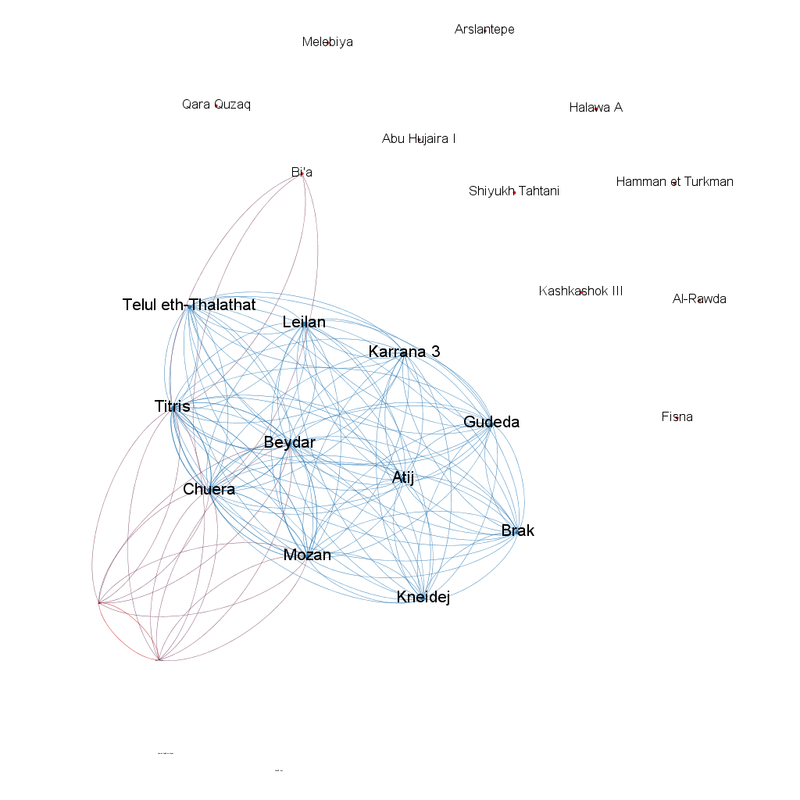 This of course is unsurprising when you think about the data we input to make this graph – all sites have some use of lithics, and we selected common types to graph, therefore, there are many connections. Once you start to establish cut-off weights for the edges or connections, however, you can start to see the peripheral sites dropping out of the network. In this graphic representation, the edge weight is reduced to only sites that share 2 or more connections (i.e. 2, 3, 4 values for edge weight). You can see that the sites on the bottom left and top right have become disconnected from the graph. Raising the cutoff for the edge weight to 3 or 4 shows most sites not longer as part of the network, with only the core of the graph remaining. So what does this series of graphs really show us? Well first, it does show that there are meaningful differences in the distribution of lithic types (i.e. we don’t find all types everywhere), but as you can probably imagine, this is not a revolutionary conclusion and you do not need network analysis to tell that lithics are distributed differently across the region (any archaeologist working in the region knows that already). Second, it shows that lithics alone can not be used to answer the kind of question we set out to answer about the connections between sites. That is not say that a network analysis of the distribution of types of lithics, particularly if sourcing could be included would not be valuable, only to say that our network is insufficient for answering these types of questions. This test case showed us that using one type of material culture was not going to be enough to reveal meaningful patterns, or at least not on the level of the data we had available to us. There is some amazing work on obsidian sourcing and obsidian use (see Golitko, Mark, and Gary M. Feinman, 2015 Procurement and Distribution of Pre-Hispanic Mesoamerican Obsidian 900 BC-AD 1520: A Social Network Analysis. Journal of Archaeological Method and Theory 22: 206–247.) but our data was not nearly as refined and not designed to look at sourcing. Third, this case clearly demonstrated that determining the cutoff weights for connection will be very important in deciding which sites are connected. As you can see from the first graph, at a low edge weight it appears that the network is tightly connected, however, using the higher cut-off weights reduces the network to almost nothing, suggesting that there in fact, is not really a strong network here at all, but rather a set of very loose connections. This small test confirms the common saying among network analysts that just because you CAN make something into a network, doesn’t mean you should. Overall, this short test case demonstrated that we will need a broader approach if we were going to produce any kind of pilot project. I will discuss our selection of categories in the next post. tl:dr Using only one type of find did not reveal the kinds of connections necessary for our investigation of EBA cities.